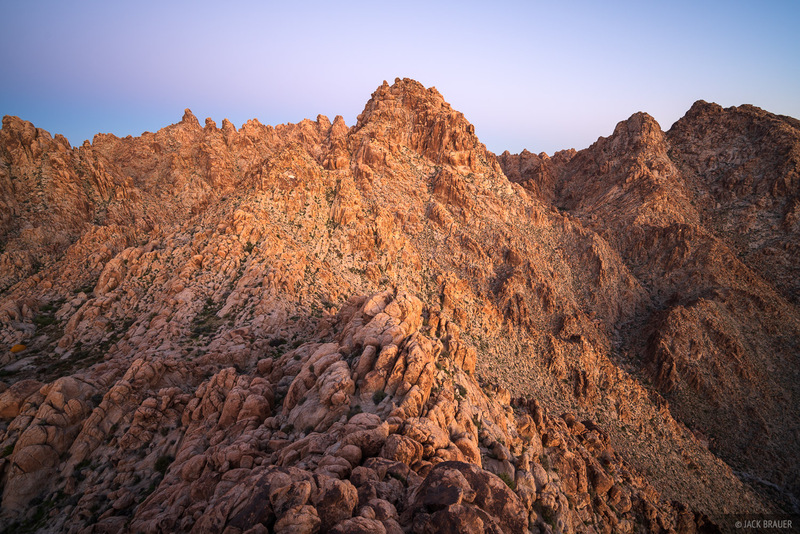 There are many wild, rugged, and seldom-visited mountain ranges in the Mojave, making it a prime area for exploratory missions. I appreciate that there are still places like this out there where we can explore on our own with little to no guiding information, and find little or no evidence of previous human visitation when we're there. For these reasons I will keep my route and trip descriptions here to a minimum in order to hopefully preserve the exploration factor for future wanderers. A large tinaja in the center of an striped sandstone formation in the Muddy Mountains Wilderness of Nevada. Our first destination of our trip was the region in and around Lake Mead National Recreation Area, which is near Las Vegas in southern Nevada. During our first visit to this area last year, we did some preliminary and somewhat spontaneous dayhike explorations in the area, which whetted my appetite for deeper backpacking adventures this year. Our first trip was a two-night backpack trip into the Muddy Mountains Wilderness. The summit block of Muddy Peak with Lake Mead in the distance. Muddy Peak is one of the dominant peaks in this area and the peak bagger in me was eager to climb it. As you can see in the photo above, the summit block looks unclimbable (without ropes) but there is actually a steep gully that is passable with some fun and challenging scrambling. 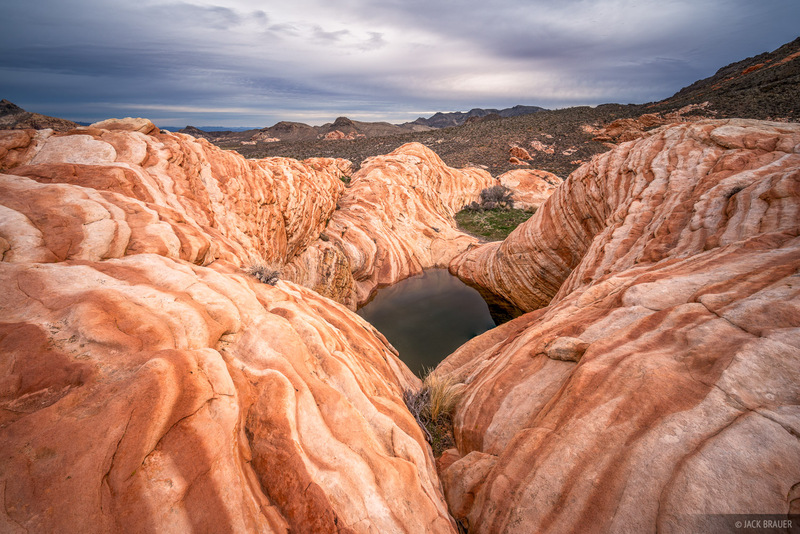 One interesting characteristic of the Lake Mead region is the presence of colorful sandstone formations that emerge randomly from the surrounding desert, as if chunks of the Colorado Plateau got geologically misplaced in the Mojave Desert. Anyone who has been to Valley of Fire just north of here knows what I'm talking about! 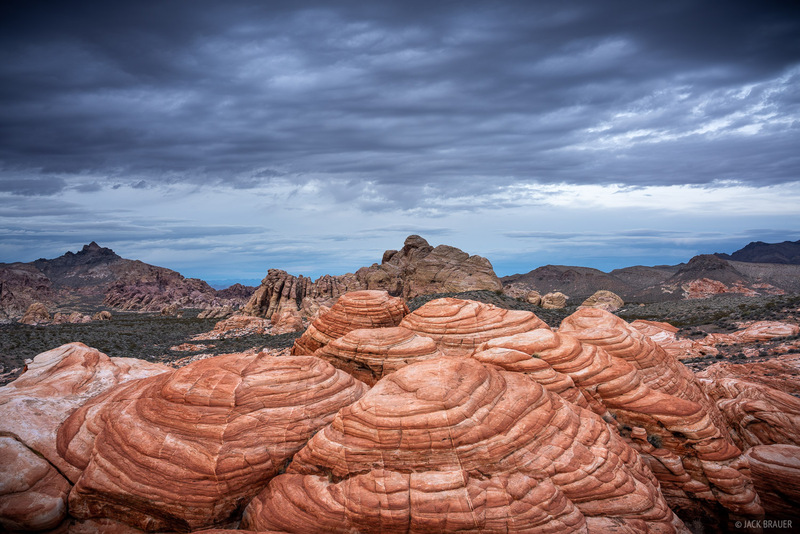 Stormy weather rolling in over sandstone formations. A potent storm rolled through on our second night in the Muddy Mountains and it rained like crazy through the night and morning. There was no waiting it out - we had to pack up and hike out in the pouring rain. Back home in Colorado, this same storm system would end up causing an historic avalanche cycle that closed Red Mountain Pass for three weeks while we were gone! 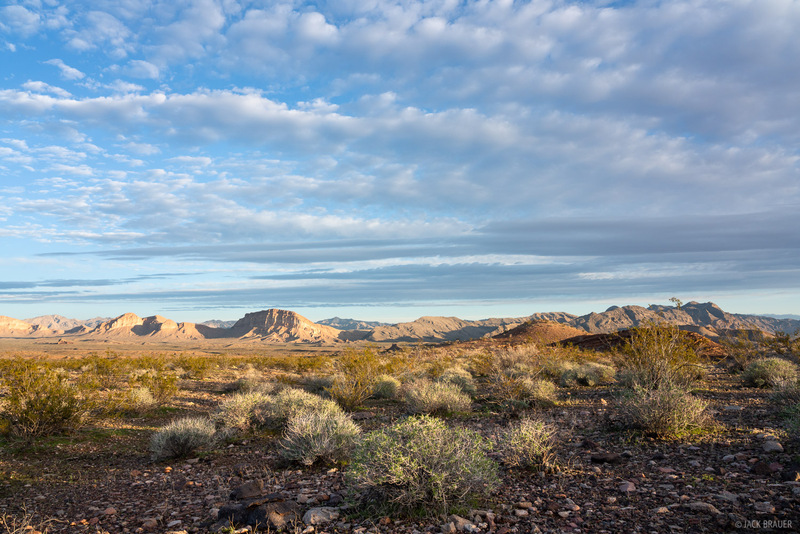 Morning in the Mojave Desert near Lake Mead National Recreation Area. The one drawback of the otherwise wild Lake Mead area is the nearly constant air traffic from planes arriving and departing from Las Vegas, as well as military helicopter training. It's a bit odd to be camping in the middle of nowhere then watch three lightless helicopters flying laps in the dark only 10-20 feet over the ground! We assumed they had tabs on us out there in the dark with their infrared night vision gadgets and we felt a bit like Taliban rebel stand-ins or something like that. 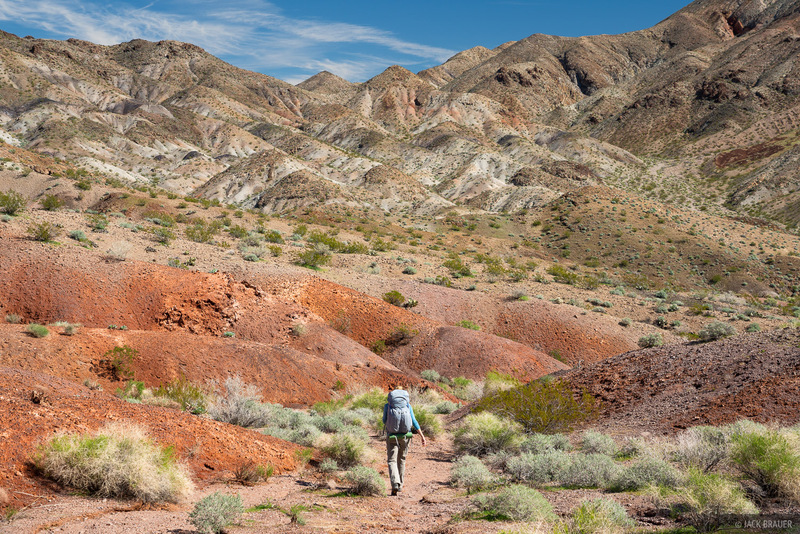 Next we headed out for a 3-night backpack trek in the Pinto Valley Wilderness in the rugged mountains that border the west side of Lake Mead reservoir. This was a trek I completely invented from researching maps and Google Earth and I was super excited to check it out. We'd pack in water for our first night, then the next two nights we'd filter water directly from Lake Mead. After setting up camp and chilling out for a while on the first evening, we scrambled up a nearby peak in hopes of photographing a sunset over the Pinto Valley. Soon after arriving at our high point, dark clouds started filling the mostly clear sky, and then we were surprised when a few raindrops started falling. I was even more surprised (and ecstatic!) 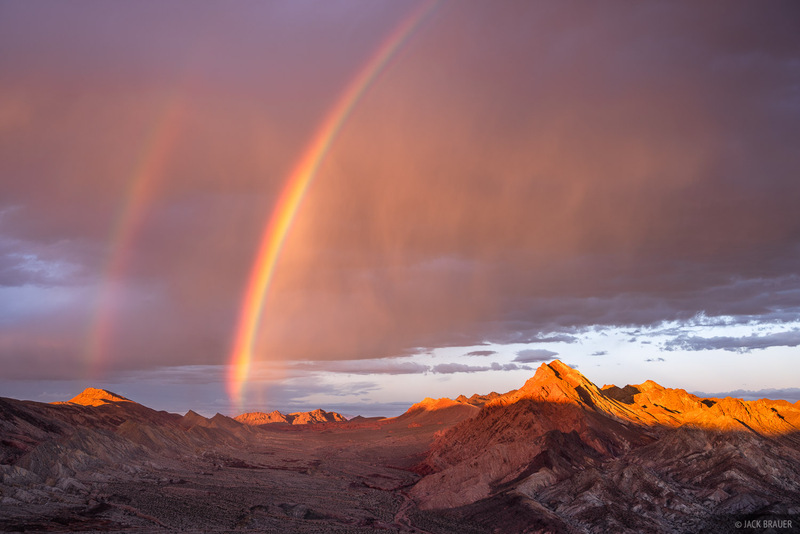 when a magnificent double rainbow appeared right at sunset! 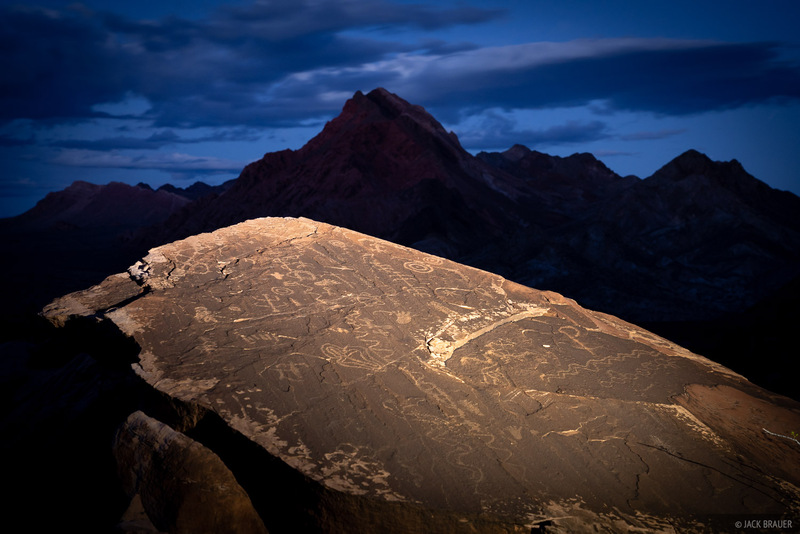 Petroglyphs in the Pinto Valley Wilderness, Nevada. Hiking in a remote valley of Pinto Valley Wilderness. I started thinking of this trek as the "Wash Tour" due to the ease of hiking along clean and gentle washes almost the entire time. Basically we'd just follow the main wash as it rose gradually to a saddle pass, then we'd descend another equally gentle wash down the other side. All the washes blended seamlessly from one to another, and when in doubt, we just followed the main wash. The washes became our trusty guides through this otherwise rugged landscape. 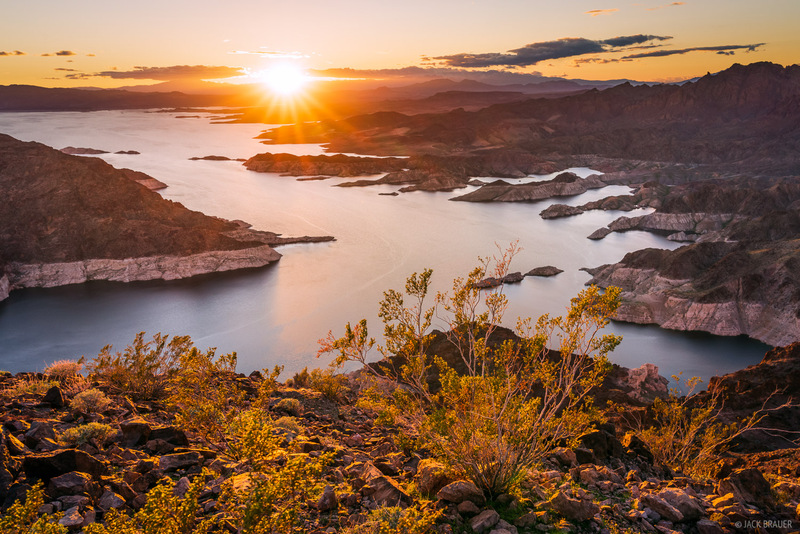 Sunset over Lake Mead reservoir. After setting up camp on the second evening of our trek in the Pinto Valley Wilderness, I took an obscure scrambling route over a long undulating ridgeline to reach a very remote summit that offered a grand vista directly over "Lake" Mead, the largest reservoir in the U.S. (measured by water capacity, though it's currently only about a third full). I stayed up there for sunset then carefully made my way back down in the dark. 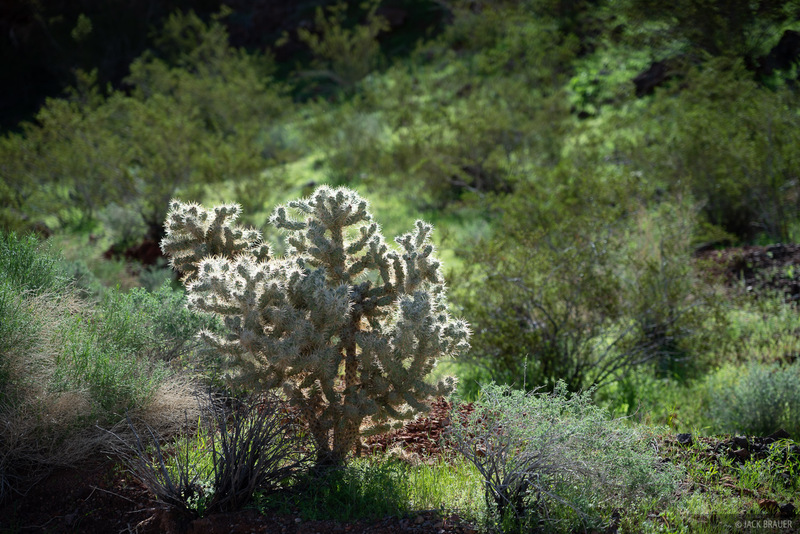 Cactus and bright spring green. 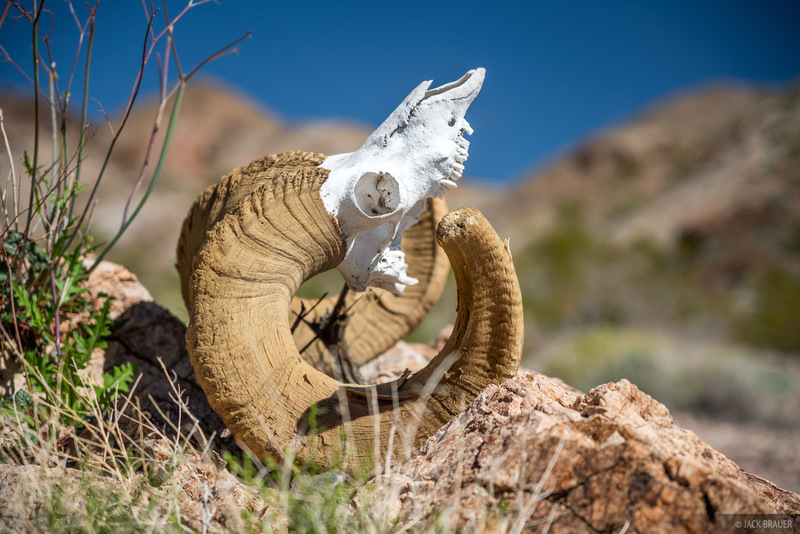 One of many bighorn skulls in Pinto Valley Wilderness. During our trek here we saw a dozen bighorn skulls and even a few live ones, though they were a bit too quick for me to photograph. Much quicker than the skulls. 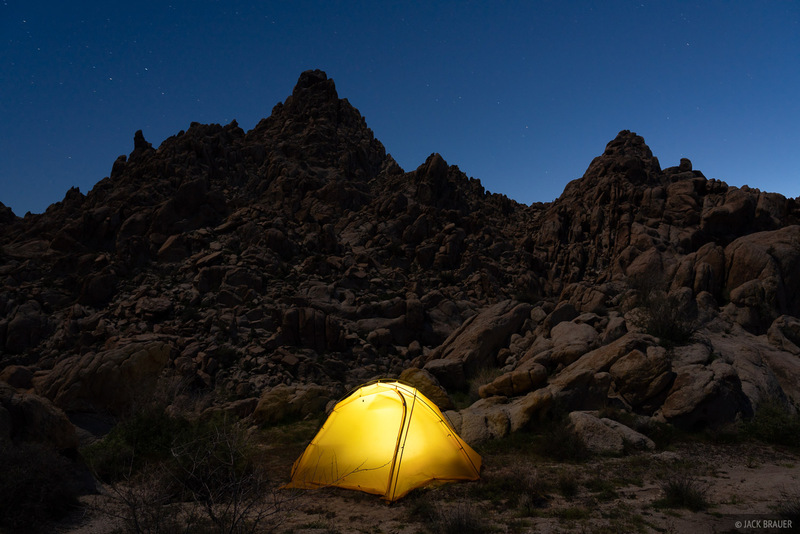 For our third and final night in the Pinto Valley Wilderness we found a sweet spot to camp on a promonotory above a cove of Lake Mead. I called it the "underwater camp" since we'd have literally been underwater if we camped there 30 years ago. You can clearly see the bathtub ring showing where the high water mark was when the reservoir was last full back in 1983. Prolonged drought and population increase has caused the reservoir water level to drop about 150 feet, and the reservoir is now holding only about 37% of its capacity. 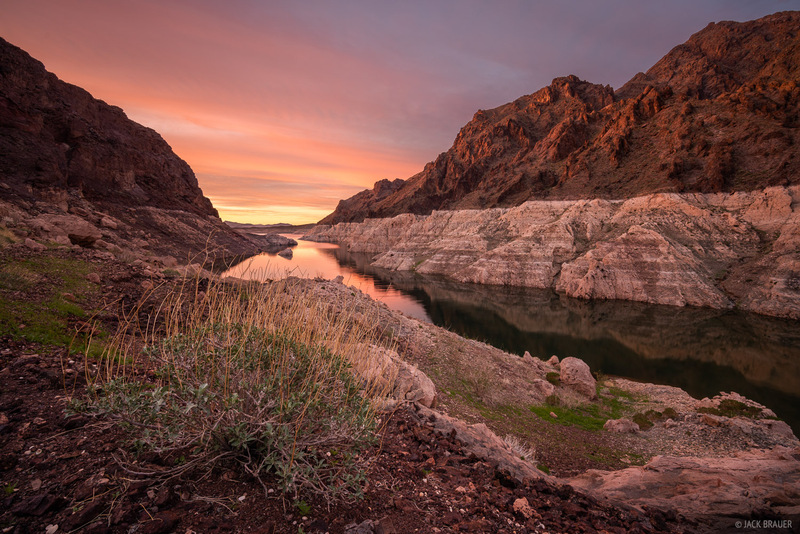 See some stunning before and after aerial photos of Lake Mead at high and low levels here. (This brings to mind the book The Water Knife by Paolo Bacigalupi about a near-future, water-starved dystopia in the southwest US). 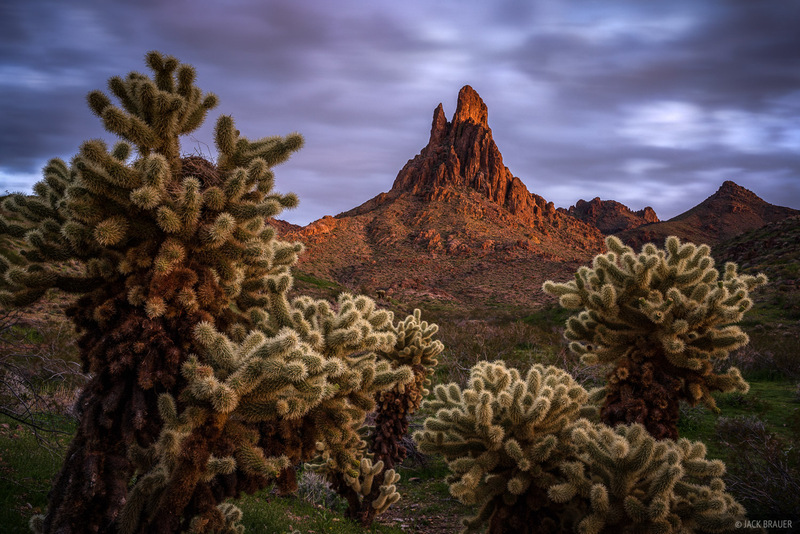 Hiking in White Rock Canyon, Arizona. 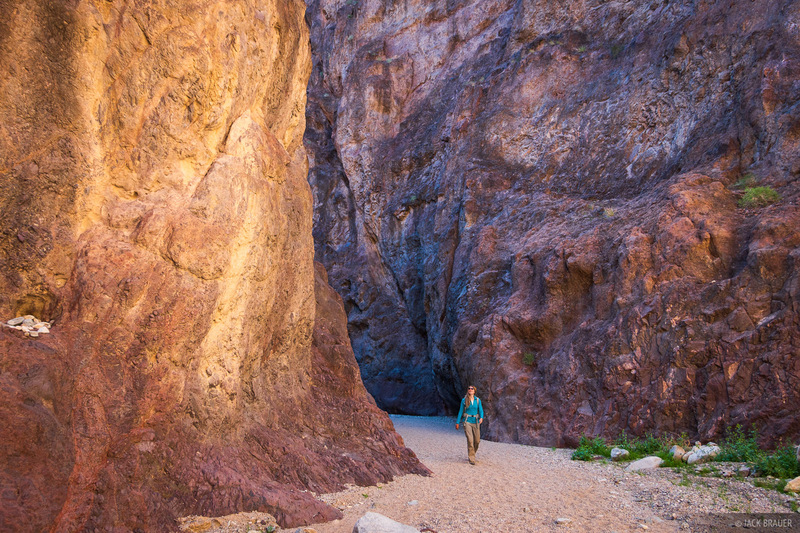 After our Pinto Valley Wilderness trek, we did a popular day hike just south of Lake Mead and the Hoover Dam. We hiked down White Rock Canyon to the Colorado River then up the neighboring canyon, including a soak in Arizona Hot Springs, a unique hot spring that fills up a section of slot canyon. Rainy weather lifting off some spires in the Black Mountains. We then continued our road trip down to the Black Mountains in northwest Arizona between Kingman and Bullhead city. This range here is both impressive and appalling at once. 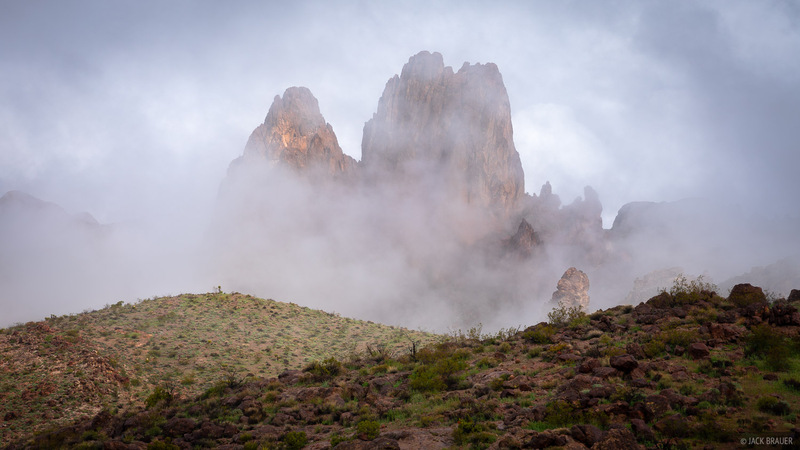 The landscape is full of unique spires and formations that would easily be worthy of some kind of national monument or park status. Yet it's also a clearly abused area scarred by off road vehicle trails, illegal landfill dumping, broken beer bottles, and target practice trash. To make matters even worse, the road that accesses the core of the area has been closed off by private mining claims. It was disappointing to discover such a special natural landscape so abused and neglected. 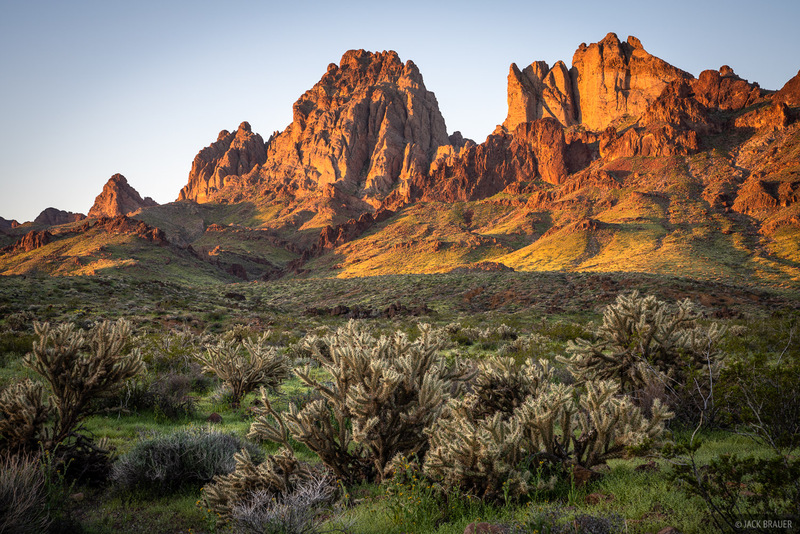 Dusk glow on Cathedral Rock in the Black Mountains of Arizona. We did manage to stumble upon some pockets of relatively untrammeled beauty around there, but I was forced to ditch several days worth of plans once we realized the road access situation. We continued on to Palm Springs, California to visit some of my cousins there and take a couple days break from camping. 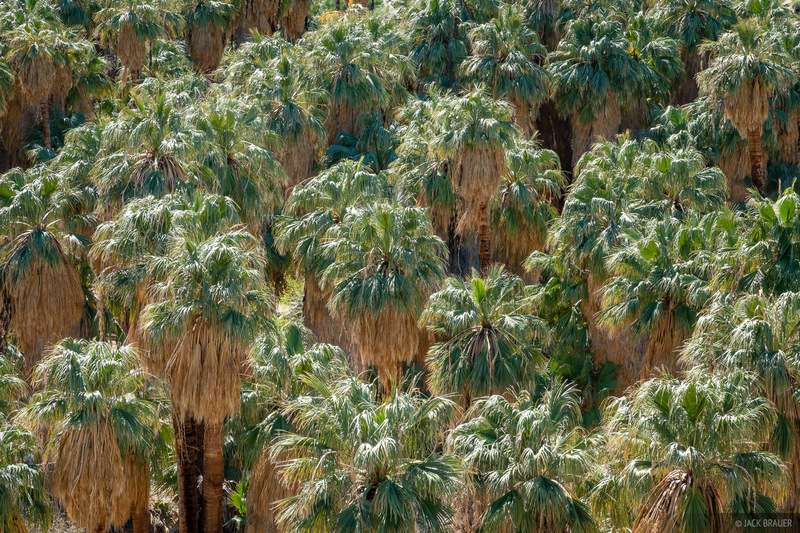 Native palms in Indian Canyon near Palm Springs, California. From Palm Springs we hit the road again and did a short but very tough backpack trip into a remote valley of the Coxcomb Mountains in Joshua Tree National Park. These are probably the most rugged mountains I've ever visited - basically nothing but boulders all over the place. That's actually why I wanted to go there in the first place, but I think I may have underestimated how grueling the 5-mile hike in would be. Boulder hopping and bushwhacking the entire way, we averaged less than one mile per hour, all while hauling our water too. Fortunately we made it to my intended destination, and even more fortunately there was actually a spot flat enough for a tent! 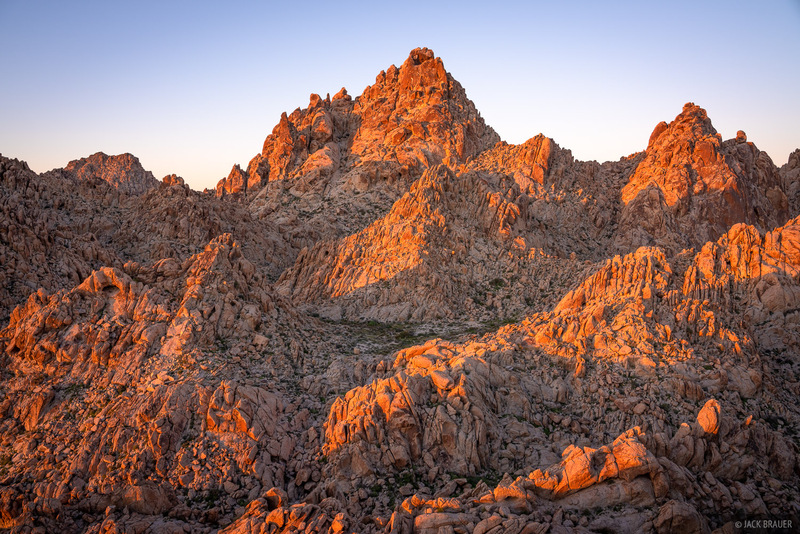 The sun sets over a super rugged bouldery basin high in the Coxcomb Mountains of Joshua Tree National Park, California. 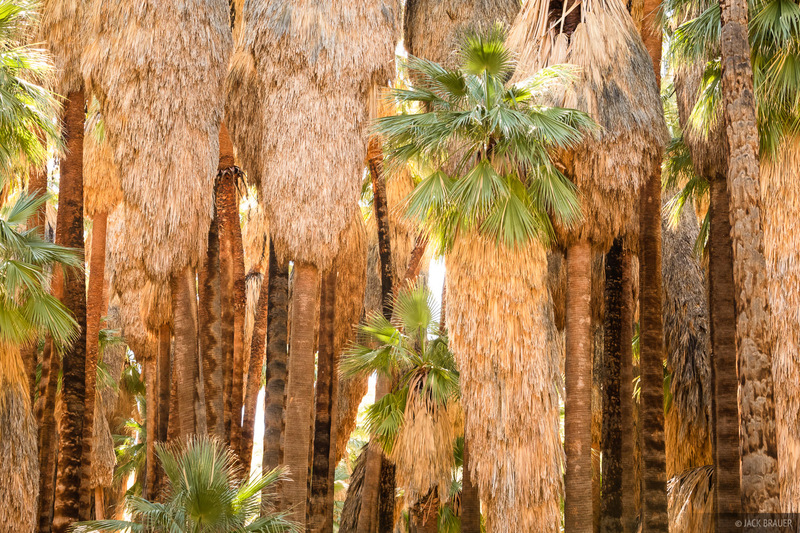 My cousins in Palm Springs had been telling us about "Yucca Man", a desert version of Bigfoot. I have my doubts about Yucca Man's existence, but I couldn't help but ponder that if he does exist we probably just wandered into his domain here in this rugged and isolated basin. Camp in the Coxcomb Mountains. 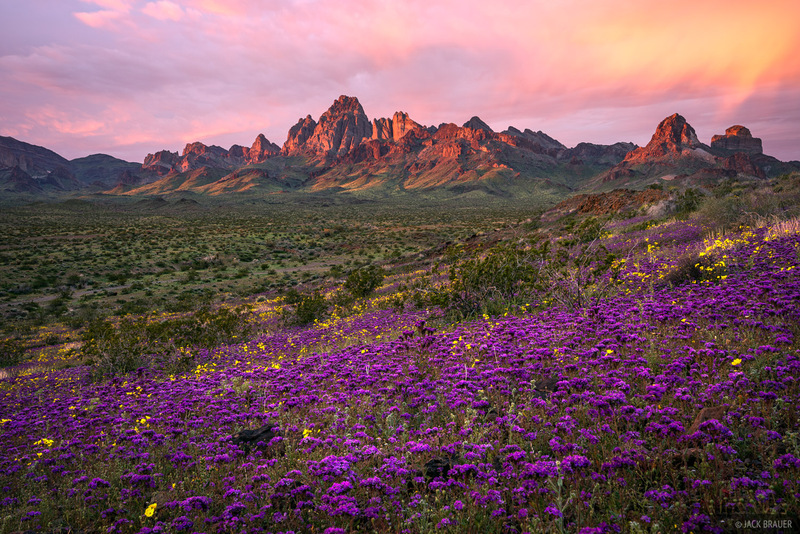 Dawn light in the Coxcomb Mountains. 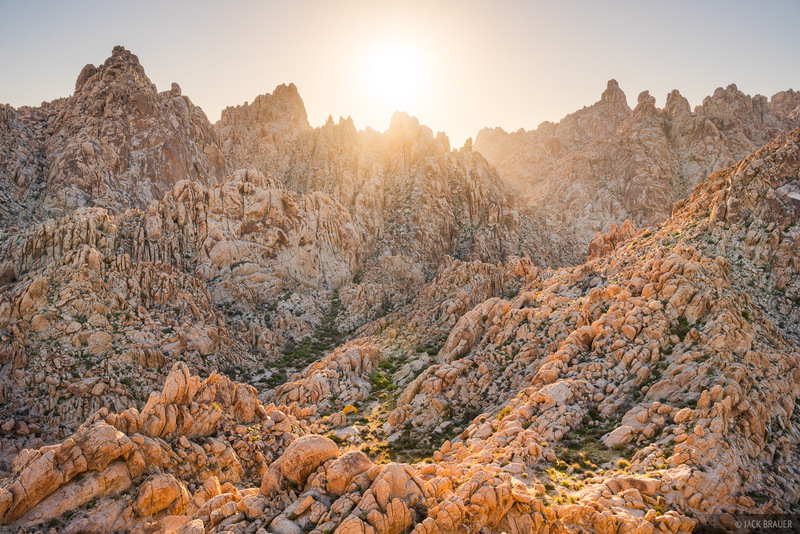 Sunrise light in the Coxcomb Mountains. We made it back out of the Coxcomb Mountains a bit battered and exhausted, then headed northeast to the Turtle Mountains. We'd had enough of backpacking and hauling water, so were happy to just camp in the truck for four nights. 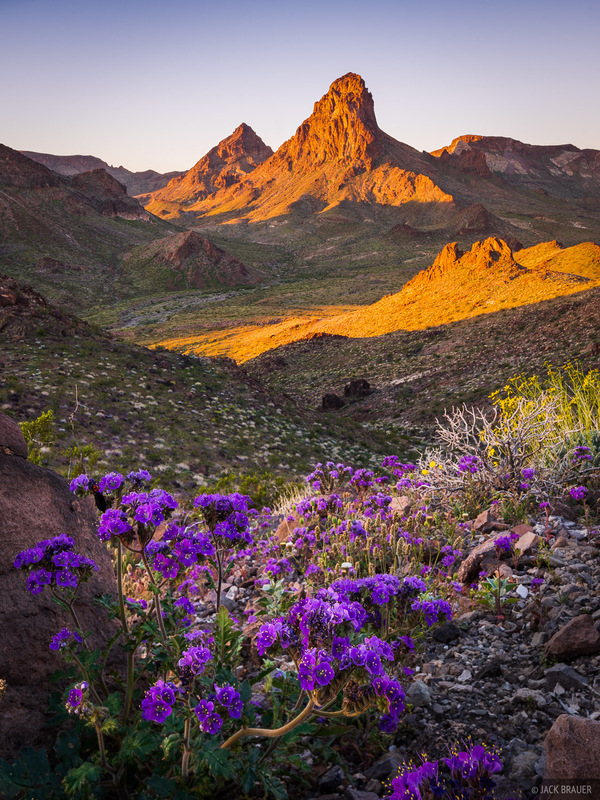 Sunrise light on Mopah Peak, the remnant core of an ancient volcano. 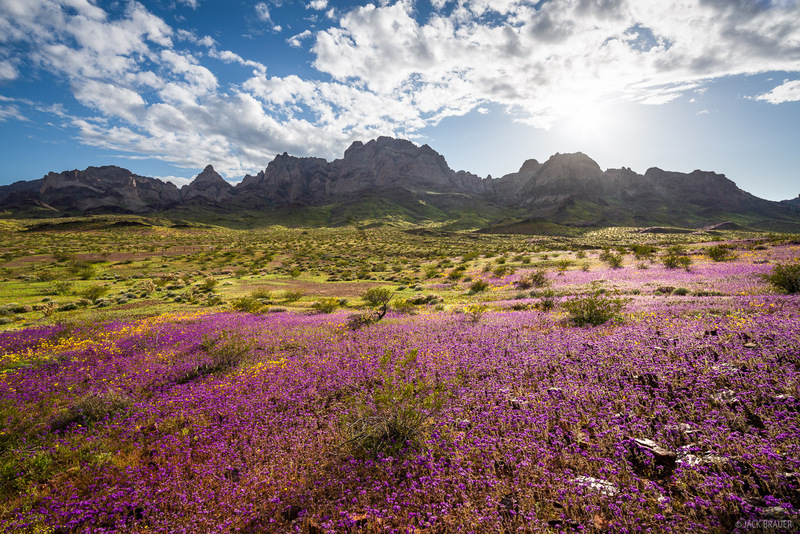 In mid-March after an exceptionally wet winter, these desert mountains were super green and adorned with large swaths of purple wildflowers which I believe are called Notch Leaved Phacelia or Scorpionweed. 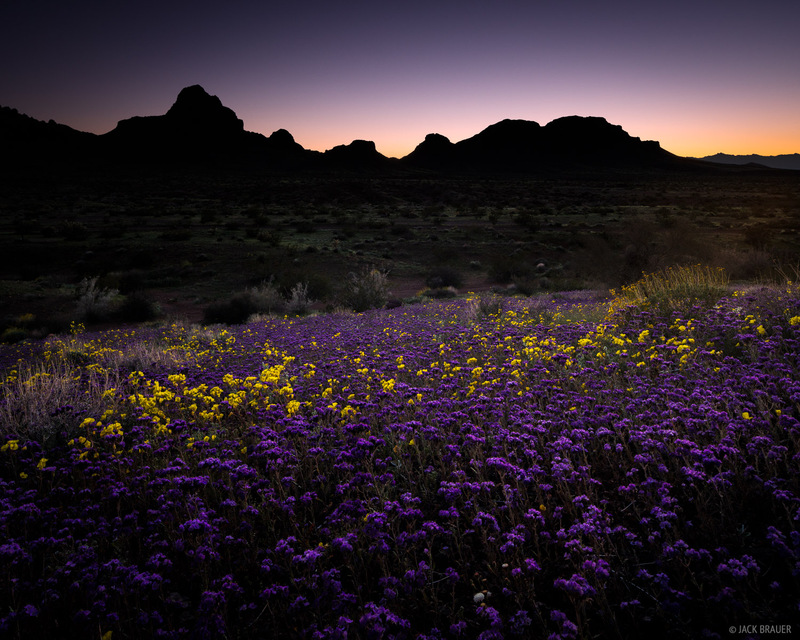 Wildflowers in the Mojave Desert. 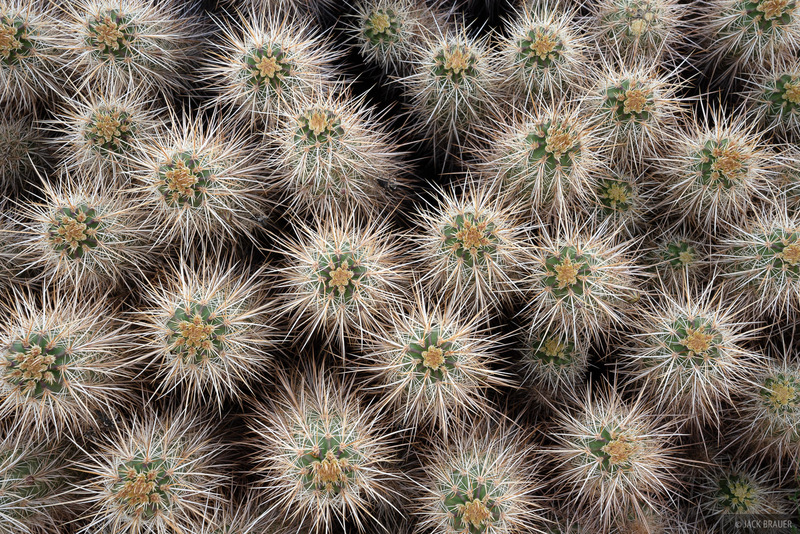 Cactus and wildflowers in the Mojave Desert. Dusk light over the Turtle Mountains. Sunrise on the Turtle Mountains. 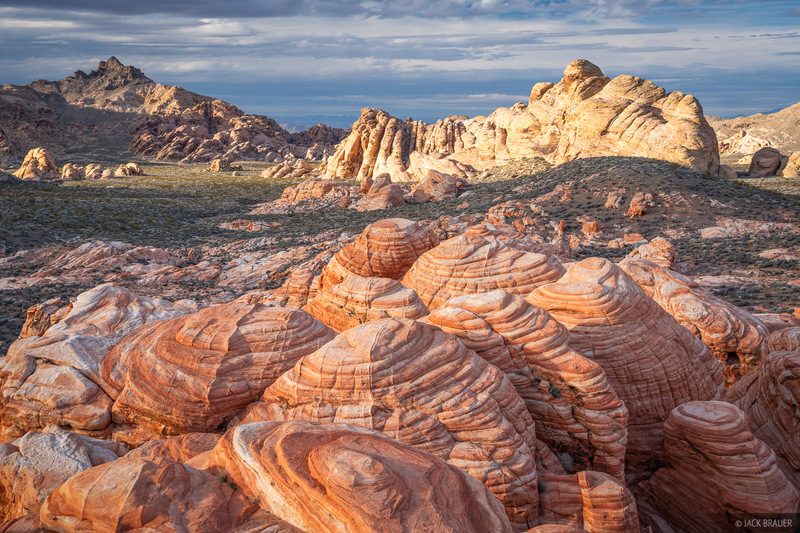 The Turtle Mountains are named for the desert tortoises that inhabit the range (unfortunately we never saw any). 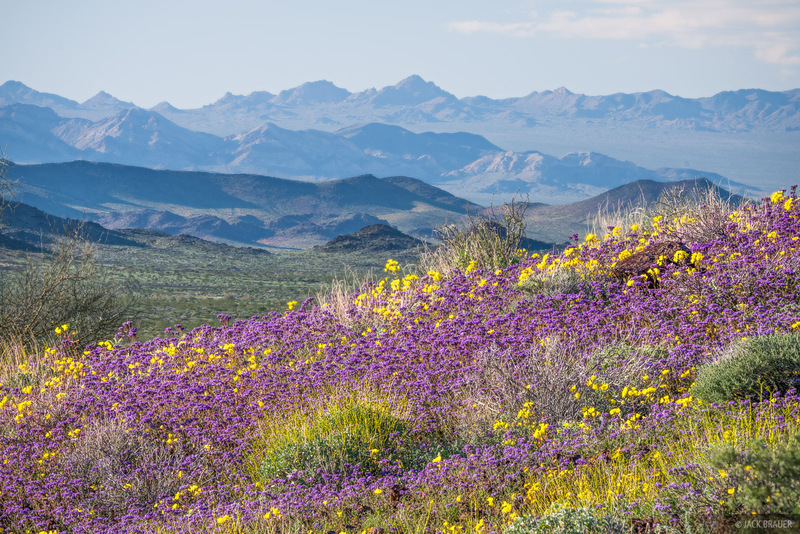 This range is a transition zone between the Mojave and Sonoran deserts and therefore has a diversity of plant species found in both deserts. 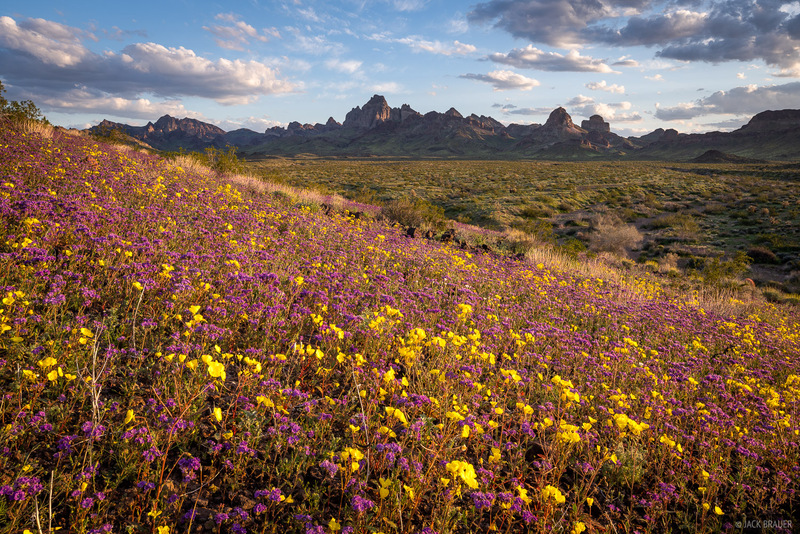 The range has been mined in the past (including tales of a rich placer deposit of gold hidden under a natural arch), but since 1994 much of the range and surrounding desert is protected as the Turtle Mountains Wilderness. 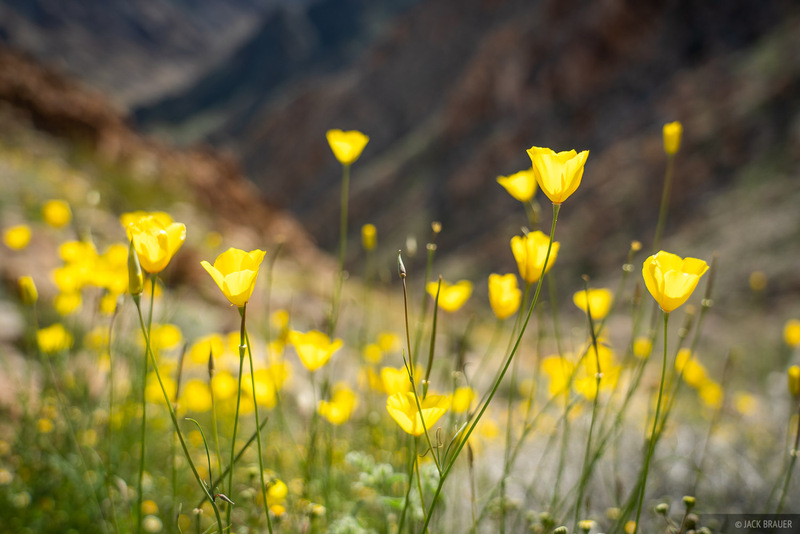 The wilderness protection has restored the Turtle Mountains with the intangible yet unmistakable wild and pure quality that has been so sorely lost in the Black Mountains which I described above. Sunset light on vast fields of wildflowers near the Turtle Mountains. 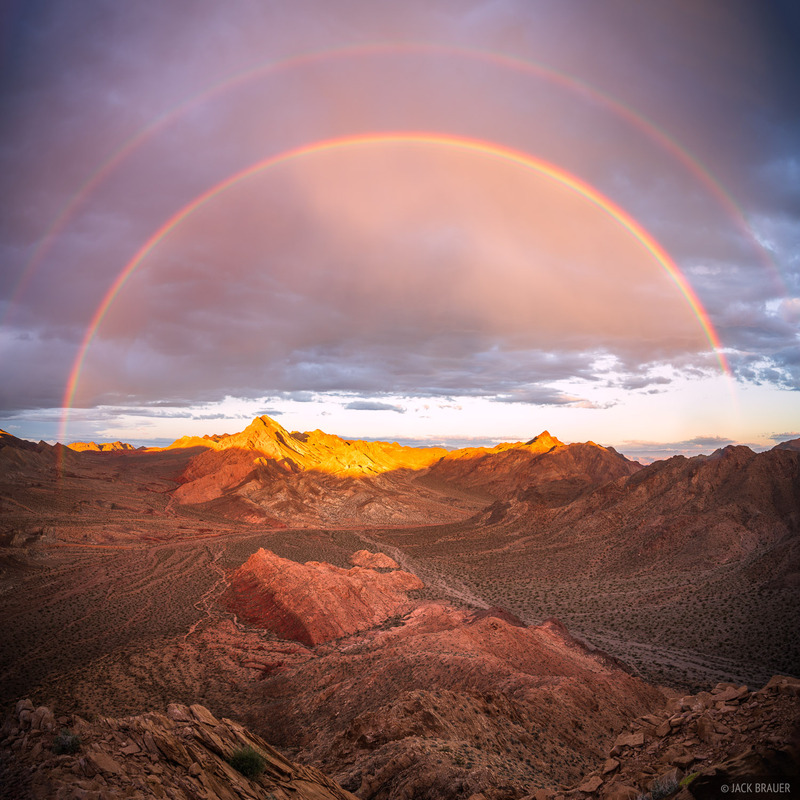 A spectacular sunrise over the Turtle Mountains in the Mojave Desert of California. One of many jagged peaks in the Turtle Mountains. While most of our time here was spent wandering around and relaxing, on one day we did a very scenic loop hike around the entire northern half of the range. 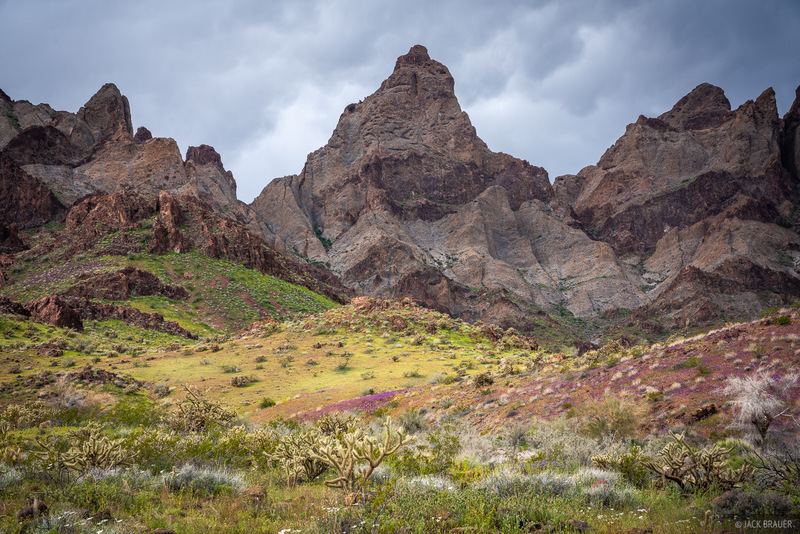 These volcanic mountains have lots of character, with many patterns of multi-hued spires and fins that take on entirely different shapes depending on the angle viewed from. 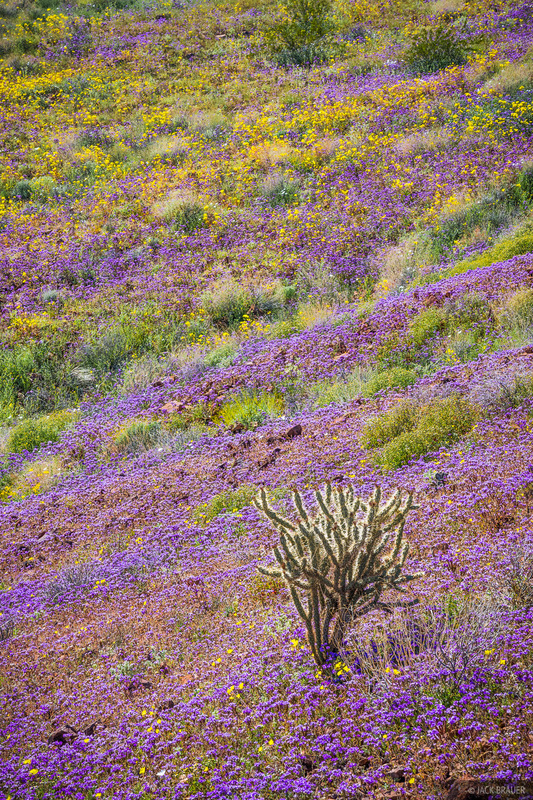 Wildflower superbloom in the Turtle Mountains of California after an exceptionally rainy winter in the Mojave Desert. Although I partly wished we could have spent the entire spring out in the desert, after three weeks of camping and exploring Mojave mountains we were satisfied and started the bittersweet drive back home. There's plenty more to explore out there for years to come! Posted in Backpacking & Trekking, Canyons & Deserts and tagged Nevada, California, Arizona.